The second best thing about being on vacation (the first being that you’re actually on vacation) is discovering new food—unknown produce, exotic spices, exciting flavor combinations, or even just an ingenious use for a common ingredient. While in Maui this August I was rendered speechless by a beautiful silky coconut and vanilla sauce enveloping delicate prawns at the famous (and somewhat tourist-trappy) Mama’s Fish House. Balancing coconut cream and vanilla in a successful savory dish takes serious skill and restraint. Perhaps even more impressive was the breadfruit gnocchi at Merriman’s, a testament to the chef & proprietor’s dedication to local produce. The cooks no doubt employed a touch of culinary sorcery to turn the starchy tropical fruit into soft pillows for the butter-poached lobster to rest on. Personally I find the most memorable dishes are often the simplest. Case and point: Merriman’s macadamia nut garlic rice. Simple, obvious and yet surprising—this dish begged to be taken back as a souvenir. Of course when I got home, I couldn’t help but tweak it… just a little. Step one was to bring the macadamia nuts to the forefront. I don’t know why, but at Merriman’s they cooked the nuts and rice together so that although the nuts imparted a deep flavor throughout the dish, texturally you couldn’t differentiate them from the rice. I’ve chosen to highlight the macadamias by toasting the chopped nuts lightly & tossing them with the cooked rice at the end. My second tweak is a splash of walnut oil, a little something to further accentuate the delicious nutty flavor. Lastly, a few slices of scallion finish the dish with a peppery zip. 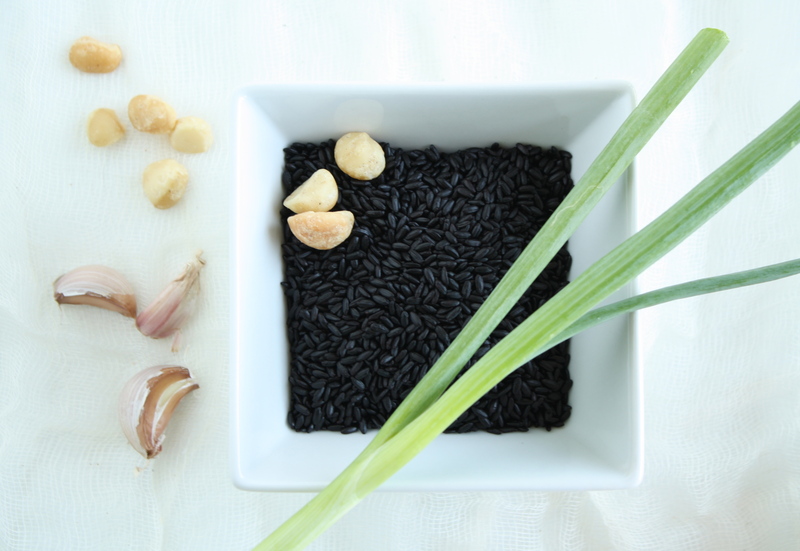 Forbidden rice is a gorgeous heirloom Chinese grain that turns dark purple when cooked, and has a nice “al dente” texture. This dish is fragrant, exotic, striking & yet straightforward… if it were a woman I think my husband would be tempted to run away with it. 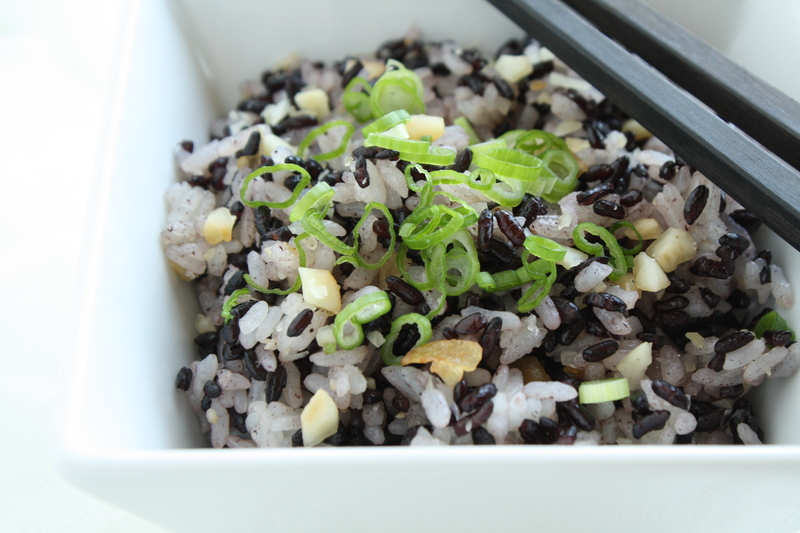 Wash the short grain rice gently in a small pot, drain and repeat until the water is clear (about 10 times). After the final rinse and drain, add ¾ cup of cold water & a pinch of salt. Cover and place on the stove over high heat. When it comes to a boil immediately turn the heat down to low and simmer until done, about 30 minutes. 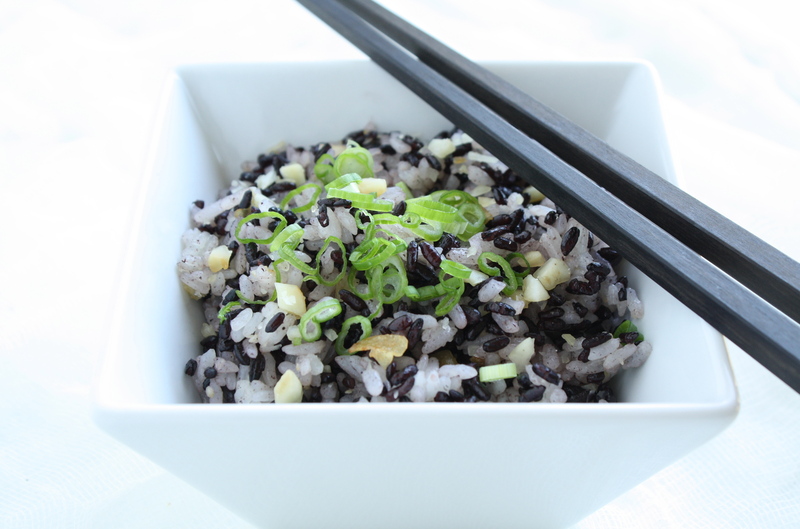 For the forbidden rice simply add the rice, ¾ cup + 1 Tbs. of water and a pinch of salt to a small pot. Again, cover and place on the stove over high heat. When it comes to a boil turn the heat down to low and simmer until done, about 30 minutes. Add the chopped macadamia nuts to a skillet (you can chop them on a cutting board or slip them into a ziplock bag and pound them gently with a meat tenderizer or similarly heavy object). If the nuts are unsalted add a pinch of salt. Lightly toast the nuts over medium high heat. When nuts are golden brown remove and set aside. Pour 1 Tbs. of neutral oil into a skillet. Add the garlic. Carefully cook the garlic over medium high heat. Remove the garlic from the oil once it is golden and fragrant. When both pots of rice are finished fluff the grains with a fork. Combine the forbidden & short grain white rice. Add the walnut oil, cooked garlic and toasted macadamia nuts. Toss to combine. Taste and add a pinch more salt if necessary. Top with scallion slices and serve.